We’d love your help. 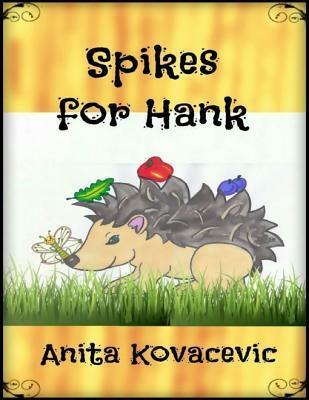 Let us know what’s wrong with this preview of Spikes for Hank by Anita Kovacevic. To ask other readers questions about Spikes for Hank, please sign up. My father, who was an elementary school principal for 30 years would have loved this book "Spikes for Hank" by Anita Kovacevic. It's a complete educational package. 1) There is the story: Little Hank, the hedgehog, is born. His parents, keenly aware of the danger that threatens baby animals in the forest are worried about him non-stop. They teach him how to roll up in a ball so he won't be attacked, they guard each one of his step, and they don't want him to venture out on his own. 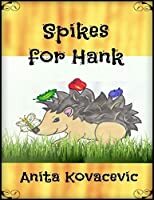 2) The hedgeh My father, who was an elementary school principal for 30 years would have loved this book "Spikes for Hank" by Anita Kovacevic. It's a complete educational package. 2) The hedgehog parents' Helen and Harvey's friends help by adding the "forest"-smarts. There are Philip the Rabbit, Sybil the snake, Lilith the butterfly, Robbie the squirrel, and Rupert the owl. Cleverly, author Anita Kovacevic uses these characters to point out differences between different species, how they live and what they do, that each one has special strength and weaknesses, and each one doesn't like something about themselves. Hank's story doesn't just move along. After each short chapter, the author poses questions parents (who presumably read with their child) can discuss with their children. I call that user friendly. Instead of the parents having to come up with their own discussion points they come with the book. Parents: Be prepared to find out the hedgehogs can do something with their needles you could not do. 3) The book also features riddles. Young readers get an opportunity to show off what they have learned by solving the riddles. 4) Lastly, the book contains fabulous coloring sheets, in case you get tired but your child isn't. "Spikes for Hank" is a quality educational book, colorful, and charming. Parents will be delighted to find that author Anita Kovacevic who is also a teacher created a fabulous "complete product." Highly recommend for parents AND for classroom teachers. Spikes for Hank is a great educational book for children that offers so much more than just a bedtime story. It has topics to get children thinking, fun activities and really encourages children to learn the art of acceptance, self-love and compassion for others. A great read for families and children of all ages. Plus Hank is a lovely character! Hank is a delightful story book all young children will enjoy reading and parents will find the questions asked at intervals throughout the story, will encourage children to not only listen and look at the pictures, but take a moment to think about what they have read or listened too. Hank is a young hedgehog with over protective parents who want to keep him inside so he won't get hurt. Of course Hank gets bored and unhappy that he can't go out and play, until his parents have a chat with him about staying safe. Then Hank discovers that being a spikey hedgehog is so much fun. Read this book to my 3 year old granddaughter and she loved the story and the colourful pictures. A beautifully illustrated book that will add enjoyment to your child's story time and can be downloaded to your Kindle right now. Today, my list of published books, in multiple genres and age groups, has grown to a list I am proud of. I participated in a charity anti-bullying e-book project Inner Giant, both the Awethologies (Light volumes), story collections by a worldwide Storytelling and poetry have always been my passion. Teaching English for over twenty years has inspired me to write, illustrate and publish my stories.